Classic pork store sandwiches, reimagined. A passion project from NYC restaurant veteran Mitch Cynamon -- formerly of Union Square Hospitality Group -- The Mozzarella Joint is a unique (and uniquely New York) food stand in Yankee Stadium. Using fresh curd, mozzarella is hand-pulled on location and is on your sandwich within seconds. The mozzarella is complemented with an Italian vegetable topping in extra virgin olive oil, and -- if you want to add a little meat -- Boar's Head soppressata. 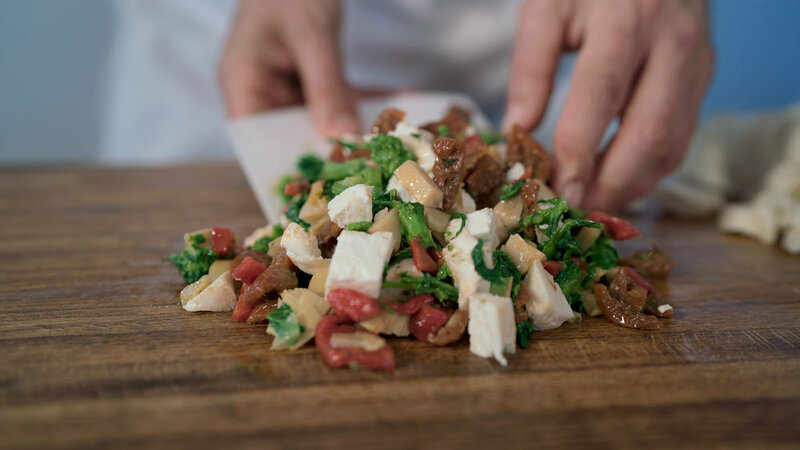 All of this deliciousness is chopped together to ensure that every bite has the maximum flavor profile. Served on local semolina bread, this fresh take on an old school pork store sandwich is befitting its home in the Bronx. The Mozzarella Joint has been featured on Fox 5, MLB.com, ABC-7, NBC-4 and NY1. Our signature sandwich, The Mozz, was spotlighted on Fox Business channel's "Mornings with Maria," as well as in Metro's "The best new eats at Yankee Stadium for 2017," Eater.com's "Where to Eat at Yankee Stadium, 2017 Edition" and most recently was named one of the best new dishes of 2017 in TimeOut New York's annual end-of-year issue. USA Today's The Journal News dubbed The Mozz a "concession sandwich standout." River Ave Blues called it "really tasty" and "one of the better things I tried" on Media Day. Pin Stripe Alley went so far as to say The Mozz "really redeemed" the stadium's food selection. We're also front-and-center in the New York Post's baseball season food preview, where Yankee Stadium executive chef Matt Gibson said, “You want to talk about Bronx? The Mozzarella Joint [is] hand pulling mozzarella." Barstool Sports celebrated our process too: "This is The Bronx, so it’s about time they brought in a place making mozzarella in the stadium," the popular website wrote. We welcome your thoughts, questions or business inquiries. Someone from our team will respond within 48 hours. We look forward to connecting!